This is the first book I managed to read for the Reading Swaps I have going on. I am going to have to do better than that in February or I will never read everything! It is also me finally reading on in a series that I haven't touched since 2007. That's just crazy and is sadly, not uncommon in my reading trends over the last few years. Between the desire to read way too many things and my books and me being separated for a couple years now, I am doing very badly on reading my own books. I have a few projects I want to accomplish this year and making a dent in this series is one of them. Since they are so easy to find second-hand and I often have book credit, I have most of the series on my TBR pile. It is just a matter of reading them. It has always amazed me that I like this series. 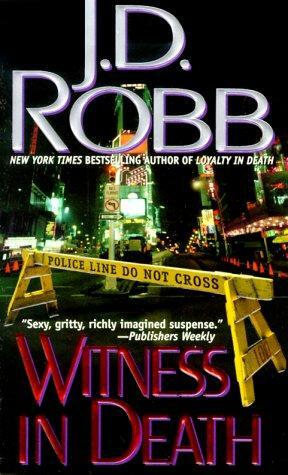 It is not my normal type of book at all and I have no interest in reading Robb's books written as Nora Roberts. Back in, I think, 2006 I found a copy of Seduction in Death on my mother's bookshelves and decided to give it a try. I do like thrillers to a point and I liked that this series took place in the future. I knew it was not the first book in the series, but I wasn't really using the library back then and I didn't want to buy anything without giving the series a try. It turned out to be a perfect easy read for those moments after I have read something I love and have no idea what to read, or I just want to read something to say that I am reading and don't want it to be anything too complicated. I enjoy trying to figure out the mysteries, I like that Lt. Dallas is a strong female character, I enjoy that she is married to the very interesting Roarke, and I like the addition of all the secondary characters. I appreciate that the characters have stories and it is not just about the cases. As the series progresses you learn more about Eve, Roarke, and other characters that make repeat appearances. This is mainly why I keep reading and enjoying the series, even if I took a very long break from it. In this one Eve is watching the opening of a Murder Mystery play that turns into a real murder. Sometimes the killer is known from the very beginning, or other times she includes a twist. I think this is the first time I didn't entirely have it all solved by the end. It was actually an original idea this time around and I quite enjoyed watching things be revealed. It was a good reintroduction to the series after such a long time away. The good thing is that even though there were... 4 years... between books 9 and 10, I still knew who everyone was and didn't have any problems remembering what had happened in previous books that was still on-going in this book. That's saying something about both series and my memory! All in all I enjoyed revisiting this series. It was like revisiting old friends and I really need to that more often with both this series and other series I have on the go! This book counts for the Great Reading Swap, as Marg told me to carry on with the series! Mainly because we used to read them together and she is like 10 ahead of me by now! Then, I also think of it as sci-fi, so I am counting it for the Sci-Fi Experience. This is my go to series when I am in a reading slump. Eve and Roarke never fail to pull me into their world and before I know it I am flying through the pages once again. Glad to hear that you are enjoying this series as well! I think the last one I read in this series was the second book. I really do enjoy them though so I may have to get back to it soon. I love this series, too. And I have to say that, reading your review, I have absolutely no recollection of this one! I read it years ago. Which means that once I make my way through the entire series - I have maybe seven or eight books left, I think - I'll be able to start over again when I need the particular kind of gripping comfort read that this series invariably offers! A friend's mother was always passing on romance paperbacks to me when my kids were little--she passed this series on with the rest, and I liked them so much I saved them. I have the first dozen or so, and now she buys them in hardback and lends them to me! Debi: It is a good series. Perfect light reads for when you want to read something, but nothing too heavy. Tink: lol Well, I stalled on this series in 2007, but I am back to it now! Darla: If I ever finish the series I will be quite happy to go back and reread. Have to finish the series first, though! Jeanne: It's a good series, huh? Glad so many other people enjoy it! I need to pick this series up again. I think I only read one last year! Marg: Not too soon. I am not caught up yet!